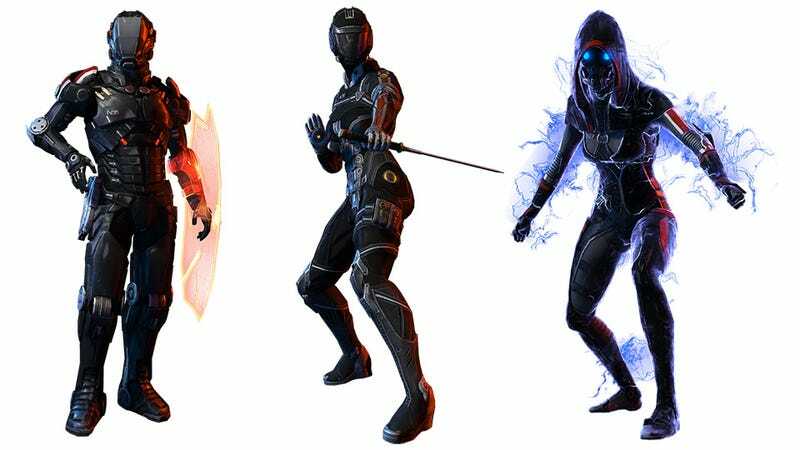 To go with the mere announcement of new Mass Effect DLC from earlier today, a leak has turned up what looks like details - and images - of the new weapons and classes available. The "Earth" DLC seems to contain five new N7 classes, three new weapons and a new game mode, Platinum. (Soldier) N7 Destroyer: Multi-Frag Grenade, Missile Launcher, Devastator Mode, T5-V battlesuit? sweeping biotic attack on their unsuspecting targets." frontline troopers carry heavy weapons onto the battlefield." creates a devastating combination attack." monomolecular blades are a menace from cover and close range." ability to slip fire makes them hard to pin down on the battielfield."